No matter your age, on a hot summer day Dairy Queen is the place to be. The DQ in Lakeside was the first one in the county opening in 1958 and Chris’ mom Norma has been coming here for 60 years! 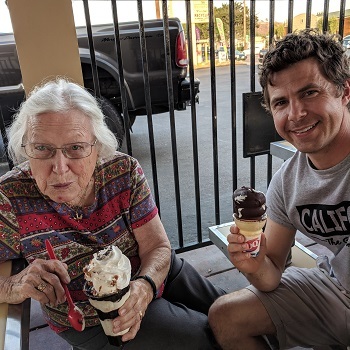 Grandson Brian remembers after school treats and together they saluted ice cream and sweet memories. Celebrating 90 years young and still going strong, my mom was ready to seize the day. My brother Steve arrived from DC and off we went. 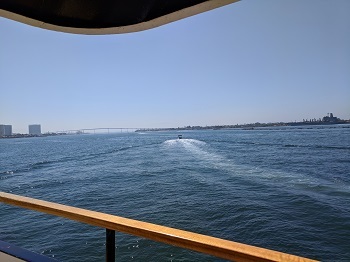 Our harbor cruise was full of San Diego’s history and since mom has lived here 75 years, it was a trip down memory lane. 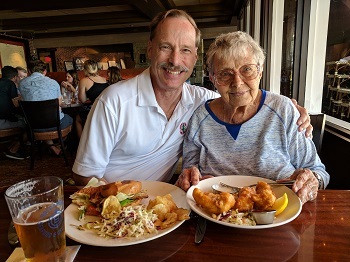 Then we had lunch at The Brigantine for her favorite fish and chips. Instead of a birthday cake, I made Jill O’Connor’s Key Lime Cloud recipe. She loved her 90th birthday celebration and feels grateful for her full life.